Its seven tongues erupting like cannon blasts from their fanged fortresses, the seven-headed serpent dragon gaped at me through its 14 lifeless eyes. My gaze shifted down the scaly necks to a low table on the concrete promenade, where incense burned alongside flowers and drink offerings set before the beast. In both senses, serpent worship has permeated the veins of Eastern doctrines like cobra venom for thousands of years. Even in the 4th century BC, for example, Alexander the Great’s officials reported live snake worship in India.1 Serpent imagery continues to factor heavily into Eastern religious symbols, stories and practices today, with some of the most important Hindu deities being associated with serpents.2 As for serpent depictions in Buddhism—well, standing by the seven-headed naga statue, I could see that first-hand. This part of Thailand, my cousin’s words echoed in my mind, is a central region of naga worship. 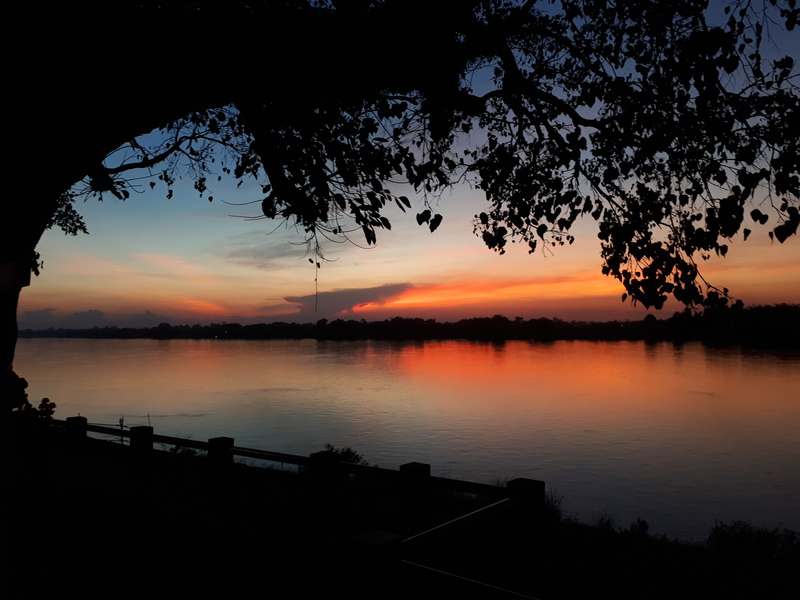 The Mekong River’s presence explained that much. 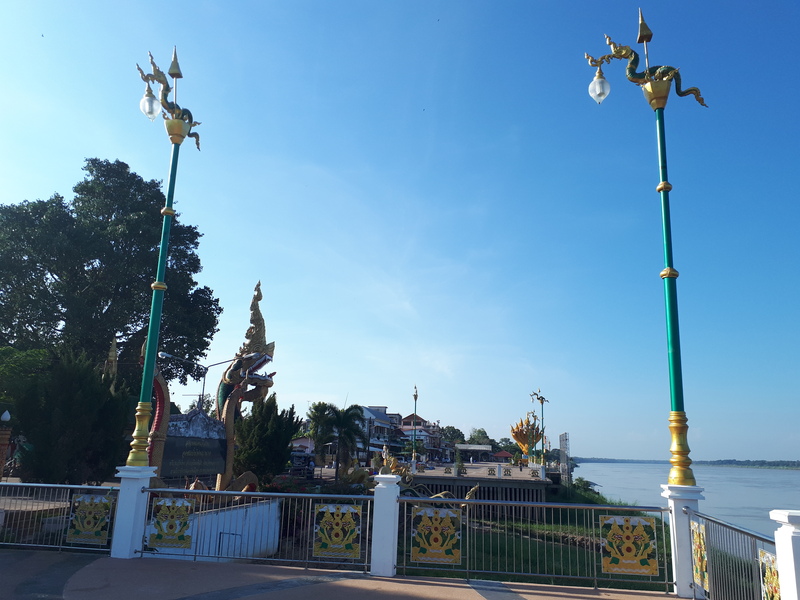 According to local tradition, the Mekong’s murky waters, which slithered in place just a stone’s throw away from me, represent a veritable naga playground. Thousands of humans still flock to these waters at the end of Buddhist lent, I heard, to celebrate the annual Naga Fireball Festival. Flaming orbs—compliments of the nagas—are supposed to shoot from the river to the sky at festival time if the nagas are pleased. 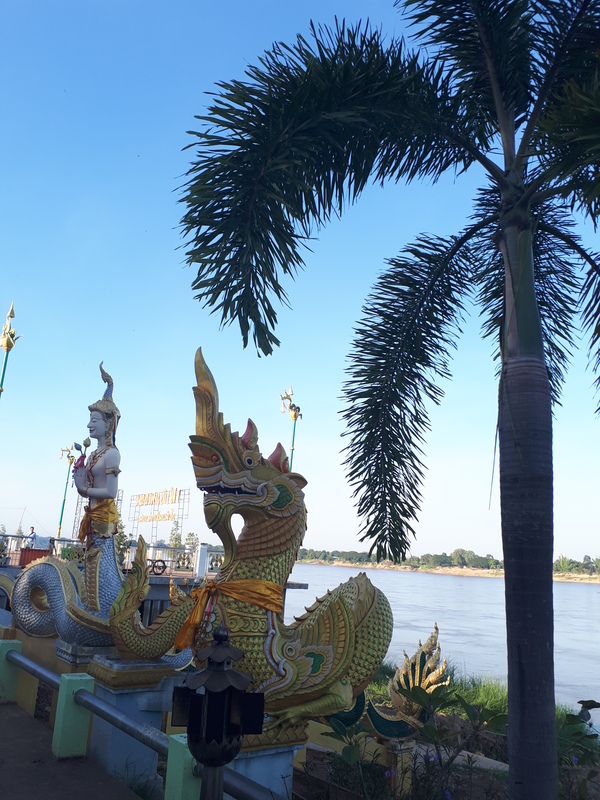 Now, from the promenade where I stood above the Mekong’s banks, I could see the nagas’ influence everywhere. 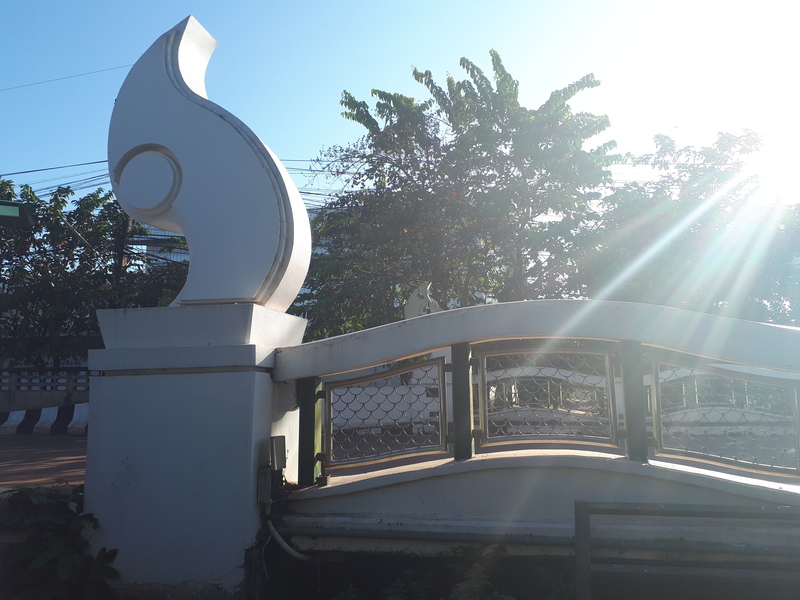 Naga images twisted forth from fireball-shaped lampstands all along the promenade’s peripheral fencing, which incorporated metal nagas into every fence panel. 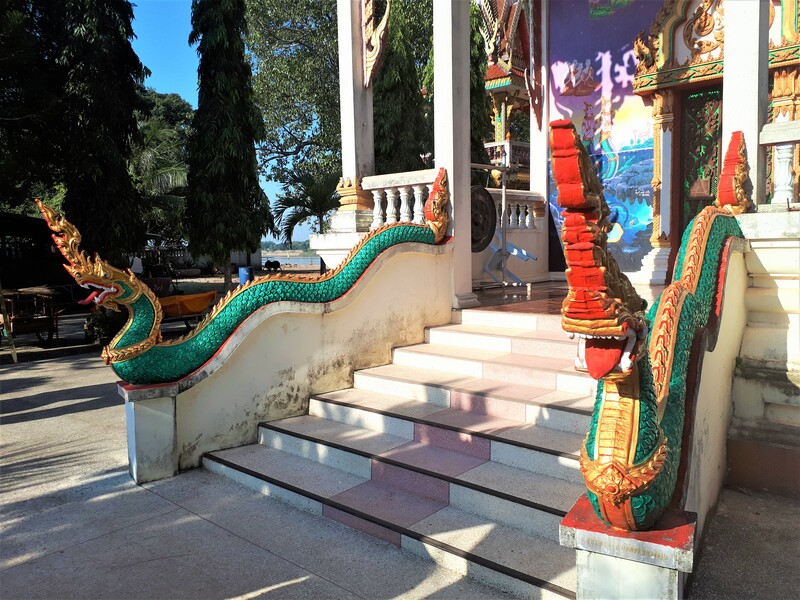 Two more nagas adorned a sign at the promenade’s end, across the street from a two-story-tall naga head roaring in front of a Buddhist temple. Like most other temples I’d seen, this one’s roof featured distinctive, single-horned naga heads curving upwards from each peak and corner. 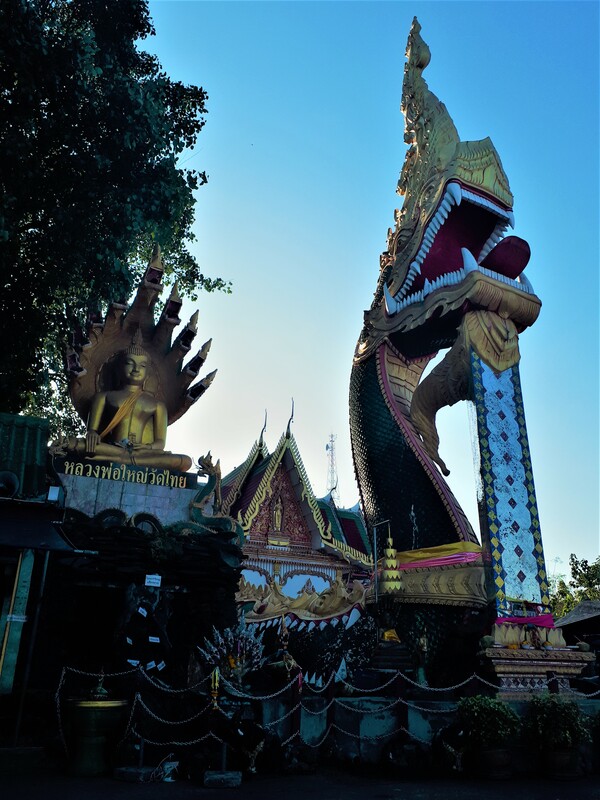 To the building’s right, a huge Buddha statue sat placidly in the shadow of a nine-headed phaya naga. Later that evening, my cousins and I strolled near another temple as the dying sun spilled fire across the Mekong’s opposite shore. “See the offerings at the base of this tree?” my cousin asked. I glanced at the ancient tree beside me, its trunk so wide I could have comfortably lived inside it. Several colourful sashes girded the trunk, and I noticed an array of offerings—silver plates, cups of water, and bits of food—scattered amidst the roots. “Look at this,” a voice from the other side of the tree broke my thoughts. 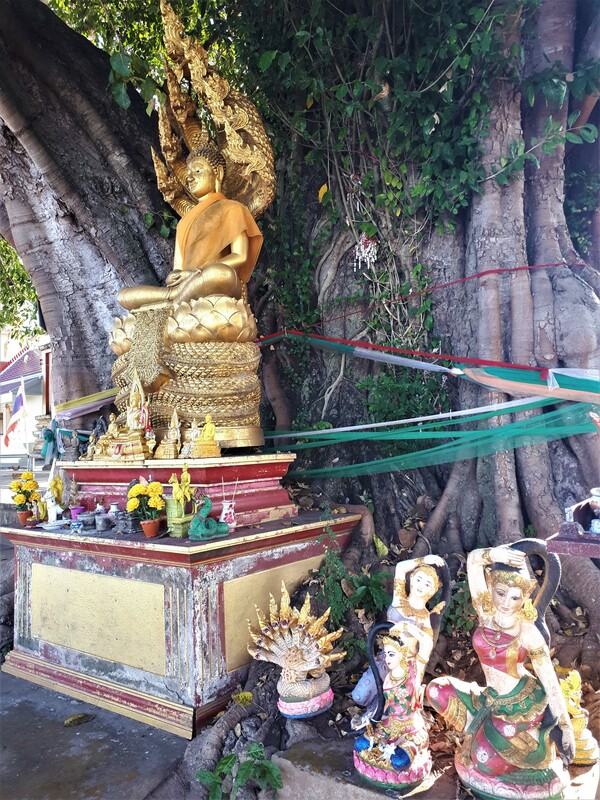 I hadn’t realized that behind the tree, a saffron-robed buddha sat enthroned on serpent coils above an assortment of offerings, idols and naga statues. Moving away from the idols, we crossed the street to arrive at another temple. Darkness had settled over the temple grounds, but I could still discern elaborate artistry—murals of spirits and deities—enveloping the temple walls inside and out. Silently, we strolled along the building until arriving at its entrance. Two ornate serpents flanked the stairway, their bodies tracing an undulating path towards the temple’s door. 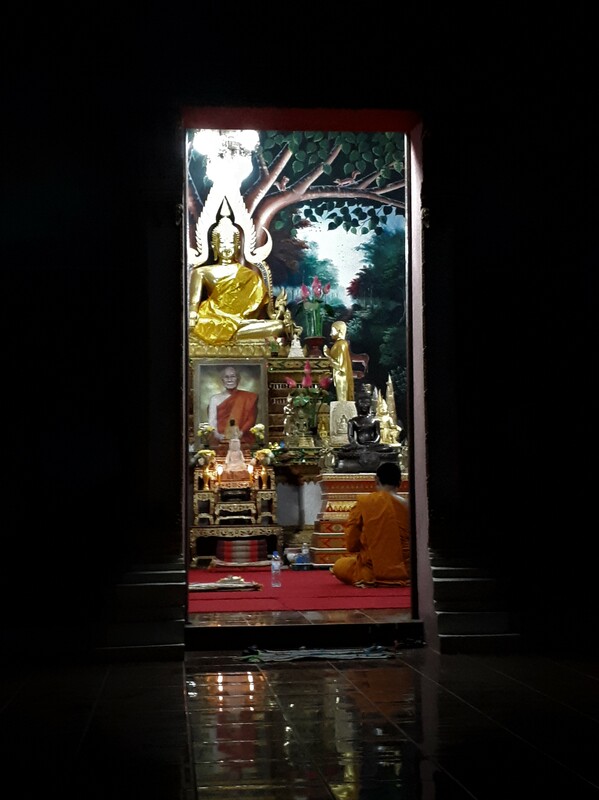 In the light pouring out from the open door, stark against the outer darkness, I could see an orange-robed monk sitting on the floor inside, his back toward us, chanting before another golden image. We turned away, passing several more shelters filled with all manner of vacant-gazed idols. I’d wondered, before coming to Thailand, whether I’d be able to feel spiritual oppressiveness at places like these. And, yeah, I supposed that I did sense a pang of spiritual heaviness constricting my heart. But more than oppressed, I thought, I mostly just feel sad. What continuous grief must weigh on God’s Father-heart to see His most cherished creation, for whom He offered His own life, entangled beneath the serpent’s heavy coils. As we left, a monk ran down the road after us, carrying something in his hands. I watched him speak with my cousin in Thai for a moment; then he went his way. How many nagas can fit into one photo? 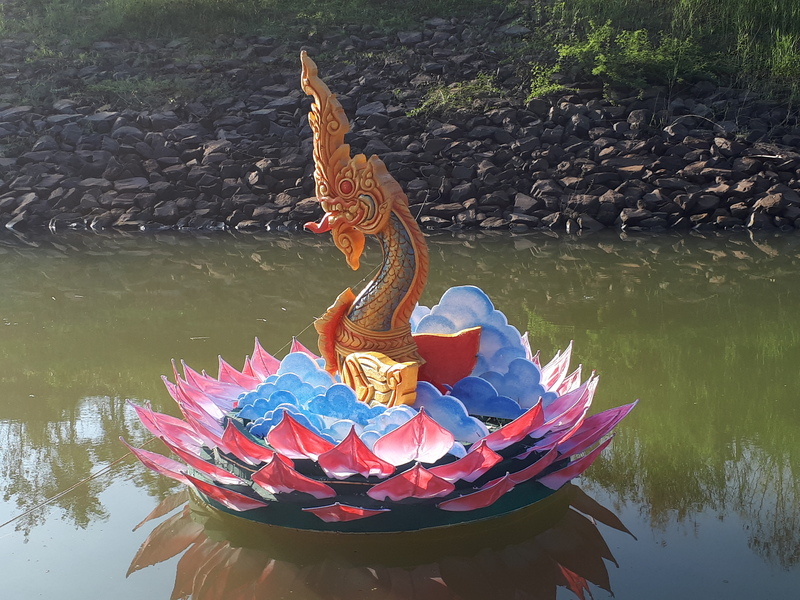 Floating krathongs, like this naga-centred one, are sent down the Mekong as part of November’s Loy Krathong Festival to symbolize the departure of bad luck. I scanned the rows upon rows of young faces turning in sync with the music. For now, the whole world—and all its cultures—remain under the serpent’s sway. (1 John 5:19) But in every culture, despite every challenge, and over every dragon, He has already sealed the final victory. All authority in heaven and earth, without exception, belongs to Him. (Matthew 28:18) Ultimately then, even the phaya naga’s seven golden heads are under His feet as well. Vogel, J. P. (1995). Indian serpent-lore: or, The Nāgas in Hindu legend and art. Asian Educational Services. Das, D., & Balasubramanian, A. (2017). The Practice of Traditional Rituals in Naga Aradhana (Snake worship): A Case study on Aadimoolam Vetticode Sree Nagarajaswami Temple in Kerala, India. In SHS Web of Conferences (Vol. 33, p. 00025). EDP Sciences. 31 sn You crushed the heads of Leviathan. The imagery of vv. 13-14 originates in West Semitic mythology. The description of Leviathan should be compared with the following excerpts from Ugaritic mythological texts: (1) “Was not the dragon [Ugaritic tnn, cognate with Hebrew ‏תַּנִין‎ (tanin), translated “sea monster” in v. 13] vanquished and captured? I did destroy the wriggling [Ugaritic ‘qltn, cognate to Hebrew ‏עֲקַלָּתוֹן‎ (‘aqallaton), translated “squirming” in Isa 27:1] serpent, the tyrant with seven heads” (note the use of the plural “heads” here and in v. 13). (See CTA 3.iii.38-39 in G. R. Driver, Canaanite Myths and Legends, 50.) (2) “For all that you smote Leviathan the slippery [Ugaritic brh, cognate to Hebrew ‏בָּרִחַ‎ (bariakh), translated “fast moving” in Isa 27:1] serpent, [and] made an end of the wriggling serpent, the tyrant with seven heads” (See CTA 5.i.1-3 in G. R. Driver, Canaanite Myths and Legends, 68.) In the myths Leviathan is a sea creature that symbolizes the destructive water of the sea and, in turn, the forces of chaos that threaten the established order. In the OT, the battle with the sea motif is applied to Yahweh’s victories over the forces of chaos at creation and in history (see Pss 74:13-14; 77:16-20; 89:9-10; Isa 51:9-10). Yahweh’s subjugation of the waters of chaos is related to his kingship (see Pss 29:3, 10; 93:3-4). Isa 27:1 applies imagery from Canaanite mythology to Yahweh’s eschatological victory over his enemies. Apocalyptic literature employs the imagery as well. The beasts of Dan 7 emerge from the sea, while Rev 13 speaks of a seven-headed beast coming from the sea. Here in Ps 74:13-14 the primary referent is unclear. The psalmist may be describing God’s creation of the world (note vv. 16-17 and see Ps 89:9-12), when he brought order out of a watery mass, or the exodus (see Isa 51:9-10), when he created Israel by destroying the Egyptians in the waters of the sea.